Some formulas to use to calculate the number of seats and length of aluminum bleachers. How many seats do you need for your aluminum bleachers at your sports facility? What size outdoor bleacher unit is optimal for your facility? Those are important questions. Aluminum Bleachers are the most economical, safe choice for mass seating solutions. But if you don’t have enough seats for your spectators, you haven’t really solved your seating problem. But how many seats are enough? How many rows of bleachers are needed? What length of bleachers should you get? Your preferred aluminum bleacher unit should be configured to provide an available seat for every attending spectator. But you don’t want to build something that is oversized so as to take up valuable space with seating that is consistently left empty and never used. There are various choices, and all are dependent on your situation. How do you calculate the number of aluminum bleacher seats you that are optimal for your facility? The most important number that you need to know is the number of spectators you expect in attendance for normal events. What about those more attended events, like rivalry games and potential playoff games? Do you regularly host additional events that may draw a more far-reaching crowd, such as specialized speakers or popular concerts? Come up with your average expected attendance for these events. Once that figure is obtained, start with the recommended industry standard of 18 inches of seating space for every spectator. Take the number of spectators you want to seat at any given event, and multiply that number by 18, the industry standard number of inches per aluminum bleacher seat space. That will provide the total number of inches of bleacher seating needed to accommodate the average number of spectators that you decided as your target capacity. 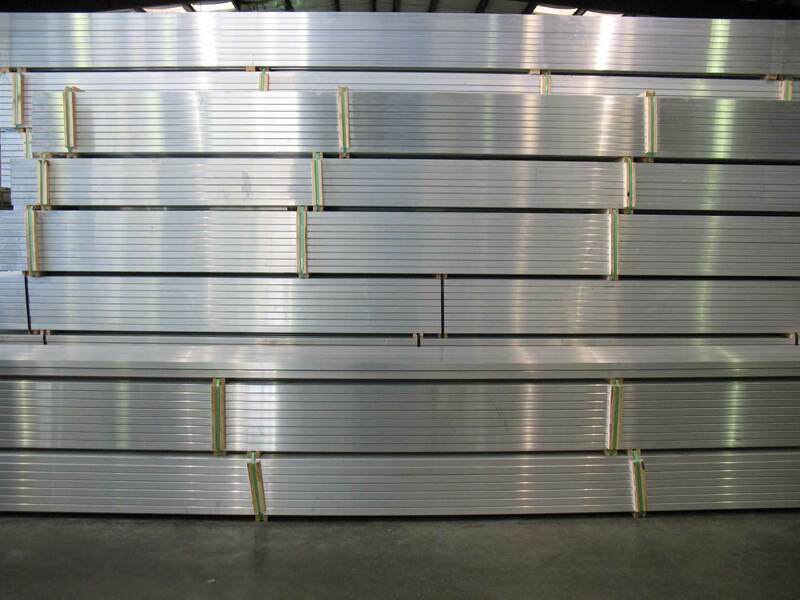 Now you have a valuable, workable number – the number of inches of aluminum bleacher planks for your seating needs. Next would be a general idea of the length of aluminum bleachers that you are anticipating installing at your facility, based on the available space you have. Include the types of events held, and the sightlines you are hoping to achieve. So, what type of standard aluminum bleacher unit is optimal for your seating requirements? Standard 3-row, code compliant (IBC 2012) aluminum bleachers are the perfect indoor or outdoor seating solution for small crowds and events. Durable 3-row aluminum bleacher units are made to be placed on flat, solid surfaces for maximum stability and safety, and are manufactured with a fully welded frame. Depending on the length of the rows of the 3-row aluminum bleachers, you can provide seating for up to 54 spectators along the sidelines of your event. 27’ per length, 81’ (972”) of total seating capacity. Five-row aluminum bleachers can help with that. Like the 3-row units, they are meant to be positioned on flat, level ground for maximum safety and stability. But unlike the 3-row bleacher units, the 5-row unit includes an aisle for easy access. Five-row units are optimal choices for both indoor and outdoor facilities, being constructed of the highest quality aluminum while remaining compliant with the most current International Building Codes (IBC 2012). 33’ per length, 165’ (1980”) of total seating length. For even more capacity, standard 10-row aluminum bleachers fulfill seating requirements up to 144 spectators. Each person will have a comfortable, safe seat with great sightlines. 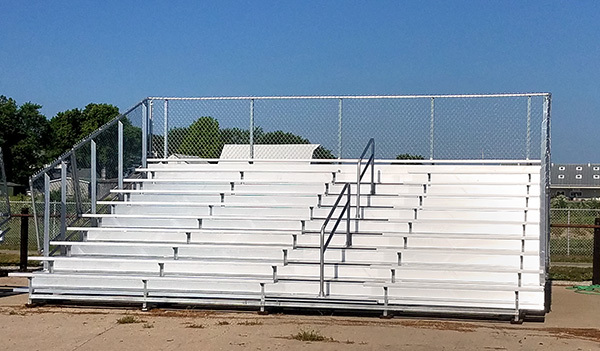 These bleacher units, as any IBC 2012 Code compliant bleacher unit 10-rows or higher, are designed and meant to be anchored to a concrete pad to guarantee safety and stability. 33’ per length, 330’ (3960”) of total seating length. Take your total lengths of row or unit choice in inches and divide that number by 18, the standard amount allowed per spectator seat. This number will give you your total gross seating capacity. Deduct those seats lost to the number of handicap spaces you intend to provide. Two handicap aluminum bleacher seating spaces will replace 4 regular seating spaces. Deduct the number of seats lost due to included aisles in the bleacher unit. Four and a half feet of aisle space will displace 3 bleacher seats. Your result is now the net seating capacity of the aluminum bleacher which will allow you to make an educated choice about which bleacher unit is the best for your facility. Standard aluminum bleachers are one of the biggest assets of your facility. Long-lasting, easy to maintain, comfortable seating that is readily available and always there can be checked off of your list as a concern for games and events. You’ll no longer have to worry about spectators bringing in chairs, blankets or whatever else they may use for seating, or whether they will be seated in an area that is not safe, or so close to the field or sidelines that there is a danger of unintended interaction with participants or officials. With properly built, code-compliant standard aluminum bleachers you can direct the spectators to a predetermined area best suited for seating with great sightlines. Always purchase your bleachers from a reputable, quality manufacturer that provides and installs IBC code compliant aluminum bleachers.